Syrian army forces entered Marj al-Sultan military airbase in Eastern Ghouta in Damascus countryside while heavy clashes are underway between them and the terrorists in the region, the second airport taken back by the pro-government troops in the last 3 days. 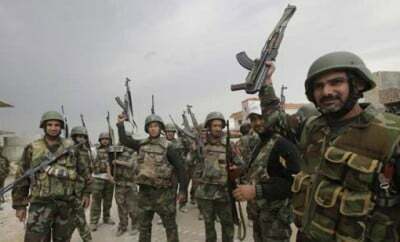 The Syrian army troops and National Defense Force (NDF) broke through Jeish al-Islam’s defenses at the Marj al-Sultan Military Airbase and reportedly entered the airbase in the East Ghouta region of Damascus province. According to a military source, the Syrian Armed Forces launched large-scale attack on Jeish al-Islam’s defenses on the army base located at the Western sector of Deir Salman and took full control over this military installation at the Southern perimeter of the Marj al-Sultan Airbase. According to latest report, Syrian forces are now making a push towards the helicopter fields. The Syrian army launched operations on Wednesday to win back control over Marj al-Sultan airbase after 3 years of siege by terrorists following its groundbreaking victory in the battle against ISIL in Aleppo that ended up with the removal of a 2.5-year-long siege of the Kuweires airbase on Tuesday. The military operations started on Tuesday when the Syrian army advanced against the Takfiri terrorists in Eastern Ghouta and retook strategic areas from the foreign-backed militants. The Syrian troops took full control over al-Mahalej area, to the South of Marj al-Sulatn, and the farms surrounding it. The Syrian army, popular forces and Hezbollah forces, backed up by Syrian and Russian air force, lifted the two and a half-year-long siege of Kuweires military airbase after killing hundreds of ISIL terrorists on Tuesday. The Syrian troops and Hezbollah forces rolled into the Kuweires airport at the end of their daylong last phase of massive operations. The Syrian army, the National Defense Forces (NDF) and Hezbollah combatants, backed up by Russian warplanes, launched the last round of their over one-month-long joint operations against the ISIL terrorists’ positions in Eastern Aleppo near the Kuweires airbase Tuesday morning, and won full control over the strategic Aleppo-Raqqa Highway. The attack started from multiple directions and ended up in cleaning up several villages from ISIL. Hundreds of the ISIL militants were killed or wounded in the operations. In the next stage, Syrian and Russian Air Forces massively targeted the last strongholds of the ISIL militants around the Kuweires airbase. In addition to the Syrian and Russian airstrikes, the artillery and mortar units of the army also shelled the ISIL strongholds to weaken their defense lines as much as possible to lay the ground for the combatants of Hezbollah, the army soldiers and the National Defense Forces to launch the final phase of their joint operations to lift the siege on Kuweires airbase. Intelligence sources said hundreds of ISIL militants were fleeing the Kuweires region to safer areas to save their lives after suffering heavy casualties in the joint massive attack of the Syrian Army and Hezbollah with the Russian air backup. After cleaning the region, the pro-government troops had to defuse a minefield planted by the ISIL before they could reach the gates of airbase. Hundreds of Syrian forces were under a tight siege at the airbase as a result of the occupation of vast areas surrounding the airport by the terrorists. When under the siege, the Syrian army’s helicopters supplied foodstuff and other needs to the Syrian troops defending the airport.